Hello. It’s been a while. My second Medium post in two years. Hardly prolific but that could change. Firstly, I want to tell you about the place I’m in. 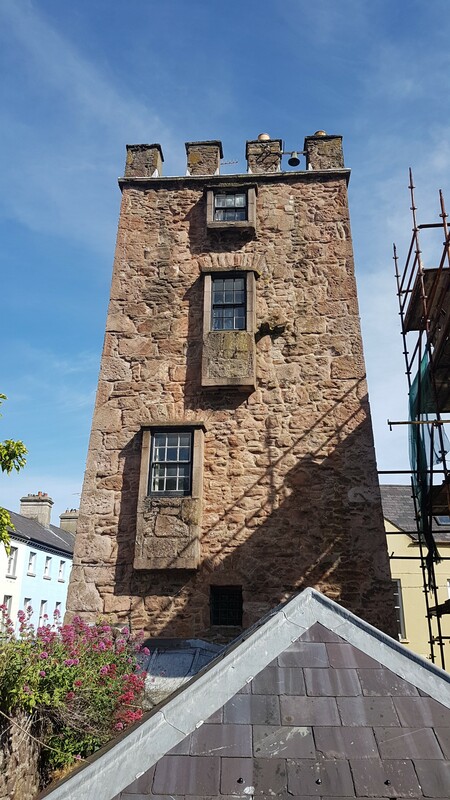 The Curfew Tower (pictured above) is at the heart of Cushendall village in the Glens of Antrim. Cushendall is a picturesque wee town where the people are of an Irish persuasion and are obsessed with hurling. The local butcher Zippy Kearney took me to my first hurling match the other night. We both gave the England-Tunisia World Cup match a bodyswerve. It was a good move. I could easily get hooked on hurling. It’s a great sport to watch, fast and skilful. And not for shrinking violets. As it turned out the Cushendall Under 21s were well humped by a superior Dunloy team, better in every department. Dunloy seemed to hit the net with every shot. Cushendall have a distinguished history in the County with 12 championship wins since 1982 but Dunloy are the top dogs at present. On the down side Cushendall play in maroon, but I wouldn’t hold it against them. The Curfew Tower was built in the early 19th century by those who had access to land and power, in order to keep an eye on those who didn’t. The Tower was bought by artist Bill Drummond in 1992 and has been used as an artist’s residency ever since. The Tower is currently curated by Michael Pedersen and myself, as requested by Mr Drummond, for a year long Neu! Reekie! project. And so we’ve curated. That hideously and sometimes rightly maligned word. We’ve asked poets, mostly Scottish, although not exclusively, to spend a month in the Tower, write poetry, record something new, and try to get to know some of the people here and the place itself. So far poets William Letford, Claire Askew, Salena Godden, George Gunn and actor Tam Dean Burn have all spent time in the Tower in the first half of the year. Their experiences, we hear, have been largely positive. This month, June of 2018, it’s my turn. Michael Pedersen will take over at the start of July. About this Tower. In the photo you can see there are 4 windows. The top two windows are bedrooms. These rooms are about 10 foot wide and 12 foot long. The floors are all hard wood as is the narrow and steep staircase. The second window down is the room I sleep in. It has a single bed and you can always hear the sounds of the town below. Boy racers gun their motors most nights. I brought ear plugs. The third window down is the living room. This has a large coal fireplace and the room is guarded by two ancient muskets. The tiny barred window at the bottom of the picture is the toilet which was clearly used as a prison cell in days of rebellion and dissent. There is a kitchen on the ground floor and there is also a dark and dusty thick-walled cell without windows that was once used as a dungeon. I’d rather not think too much about what went on in that dungeon and I won’t be posting any photos of it here or on social media. I tend to avoid dungeons. The building is relatively pleasant in a utilitarian way during daylight hours. At night it changes with the light and the atmosphere shifts. Sometimes the building speaks to you. For those first few nights, as you acclimatise, the strange sounds, the creaking, the unidentified movements below, can be disconcerting. As Selena Godden noted, in her Curfew Tower blog, this can play on your mind in the dead of night, especially when the wind gets up. You start to wonder why you’re there, what secrets this building holds, who still occupies it, dear materialist soul that you are. I like it here. I feel at peace with everything around me. The living and the dead. The Tower can be conducive to thought and artistic practice and that’s the way it’s been for me. Last Friday I went to Belfast to meet Bill Drummond himself. He was speaking at a conference in Queen’s University on Heritage and Architecture, in that engaging roundabout storytelling way he has. Somehow or other I ended up fielding a question near the end of the event on my experiences living in the Tower. I mentioned that, the day before, I’d finished writing the manuscript of a new book and I’d sent a copy to Bill to print out. My time here has been productive. A subtext to why I’ve written this blog post is in the lines above. A new chapter begins.